3000 march in Salt Lake City to protest Trump | Fight Back! 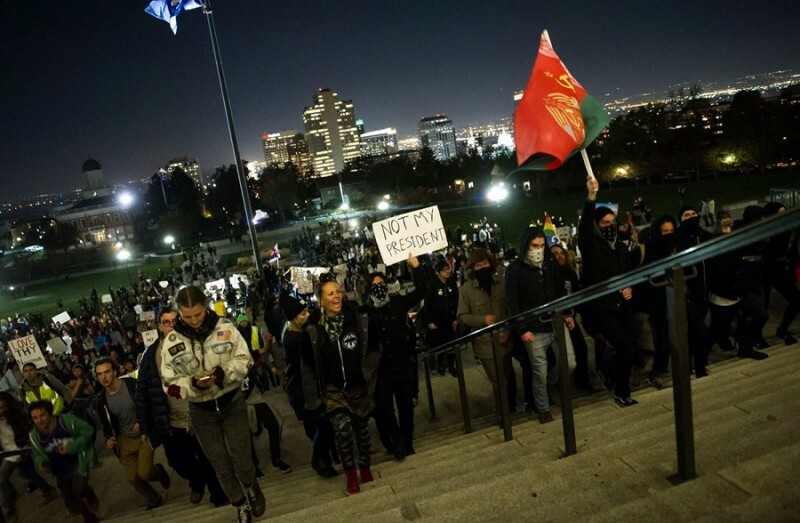 Salt Lake City, UT - Roughly 3000 people demonstrated against Trump's agenda, Nov. 10. The event was organized by a coalition of student, worker and community organizations. Protesters gathered at the Wallace F. Bennett Federal Building. The crowd chanted, “Racist, sexist, anti-gay, Donald Trump go away!” and “Liberation not deportation!” Several speakers representing various activist organizations in the valley spoke urging opposition to Trump's agenda. Organizer Gabriella Killpack, a Teamsters and organizer of Utah Supports Rasmea Odeh spoke of her hope for a better world built through working class solidarity and struggle. “I'm here today because we deserve more than what this society offers us. What Trump promises, and what Clinton promised. What I've learned from organizing in my union is that together, we don't beg for more, but we stand united and demand it. When people organize together like we're doing right here, we can create a world that is just for all." After the speeches, the gathering took to the streets, filling both lanes of traffic of State Street, the busiest street in Salt Lake City. The energy of the crowd was high as they marched through the core of downtown Salt Lake, and voiced their outrage at Trump's election. As the march approached the end of the route, people chanted "Take it to the capitol!" They continued up the hill toward the state capitol, while hundreds more began to show up, having seen the demonstration on the news. In spite of rumors that riot police might be awaiting them at the capitol, the demonstrators were not deterred and made the decision to continue the march to the capitol building. Upon arriving, it was discovered that there were no riot cops, and demonstrators filled the capitol steps to capacity.